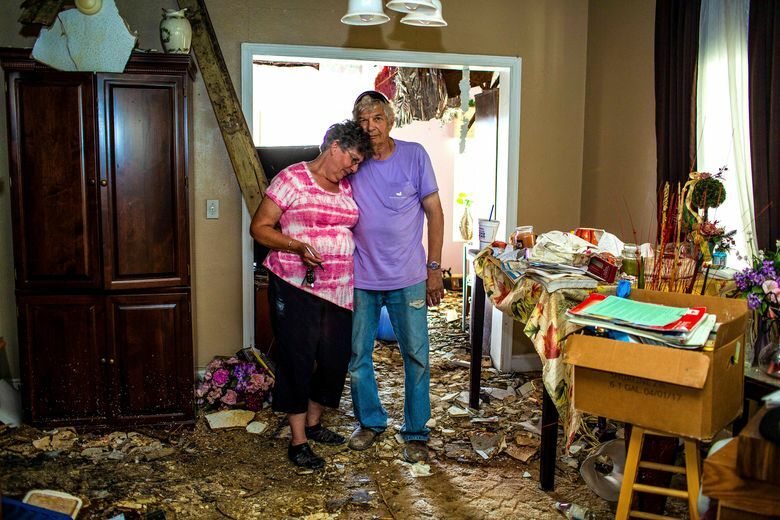 Power, and a sense of normalcy, are slow to return to this Florida Panhandle county where residents are struggling to rebuild their lives as leaders begin to scale back emergency help. MARIANNA, Fla. — After two weeks of working grueling hours on hurricane response and sleeping fitfully under a tatty Auburn University fleece in his office, Rodney E. Andreasen, the emergency management director for Jackson County, Florida, decided on Friday that it was time to nudge his neighbors back to normalcy. He started by scaling back on round-the-clock staffing. Then he turned to the county’s eight multiagency “points of distribution” — known as PODs — which have been handing out free drinking water, ice, canned goods, hot meals, diapers, garbage bags, and the most coveted item of all, toilet paper. Seven of the sites would have to be shut down within the next few days, he told unhappy local officials, with only the handout point in Cottondale, west of town, to stay in operation. But many in Jackson County are simply not ready for the hurricane relief to end. There is a feeling, fair or not, that officials — even the well-liked Andreasen — are moving too fast, chasing the image of normalcy before a real recovery has taken root. That feeling of being hurried, and eventually left behind — the normalizing of a catastrophe — is a growing worry for people who are caught between a short-attention-span country that has seen one disaster after another and the long-term effort it takes to rebuild battered lives. 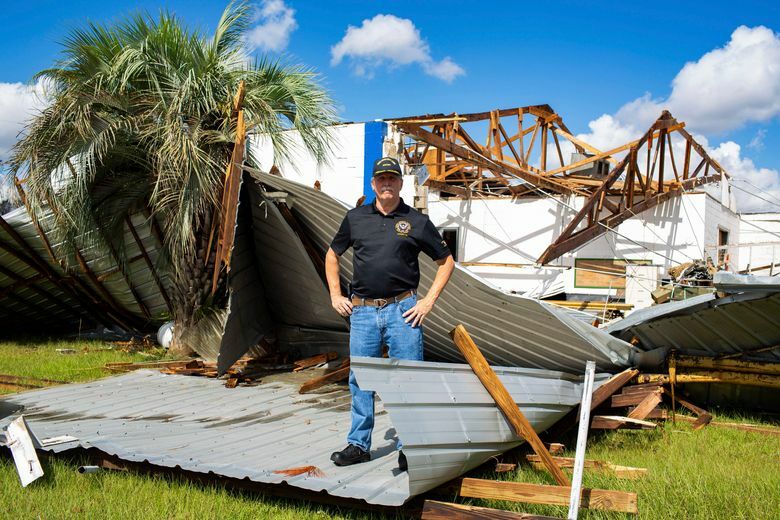 Marianna, a Florida Panhandle town with a population of about 10,000, was hit almost as hard by Hurricane Michael as Panama City was, 60 miles to the southwest near the coast. Downtown Marianna still looks like London after the Blitz. Heaps of shattered brick storefronts spill into the streets, and numb residents pick through the ruin of what once were flourishing neighborhoods. About 600 structures in the county are so severely damaged that they cannot currently be occupied, officials said, and more than 400 of those are likely to be bulldozed, because of wind, tree and water damage. 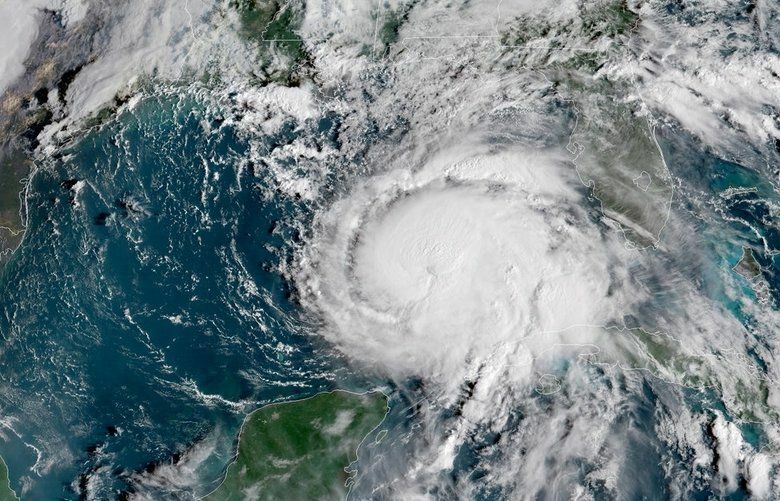 Almost 82,000 homes and businesses in Florida were still without electricity Sunday, authorities said, and in Jackson County, which includes Marianna, some 75 percent of customers still did not have electric service — with rumors of a rainy week ahead. 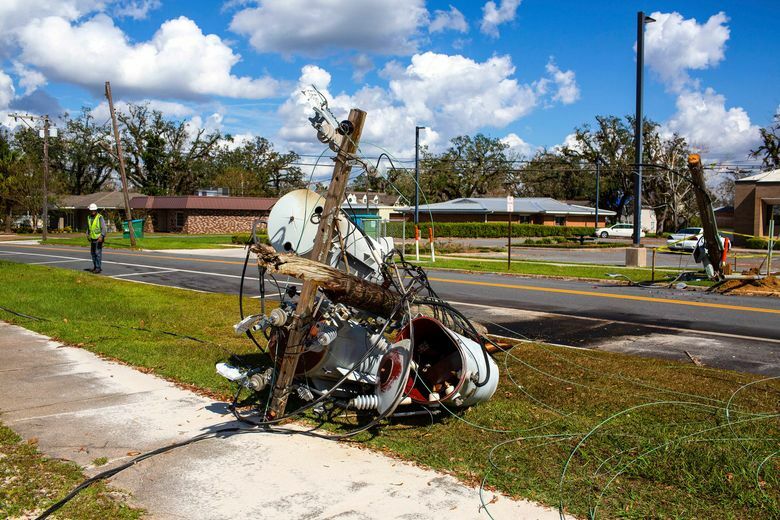 Power is not expected to be fully restored in the Marianna area for ten or 11 more days, emergency management officials said; that is around when schools in the county are scheduled to reopen. “They are basically rebuilding the whole grid from scratch,” said Christopher J. Eliadis, an emergency management coordinator from nearby Walton County. President Donald Trump landed, toured, commiserated and left Florida a week ago. The national media has largely moved on. Now the PODs are closing down, and that is troubling news for some residents, who see the stations, with their contingent of National Guard troops, as signs that they are not being forgotten. “People are under the misconception that the minute power goes back on, everything returns to normal,” said Alicia L. Corder, town clerk of Greenwood, who was overseeing operation of a POD there on Saturday. In Greenwood, a crossroads town of 700 people just north of Marianna, Guard troops and volunteers were handing out supplies — bags of ice, adult diapers and tarps were in high demand — to people in a line of cars outside the small town hall on Saturday afternoon. Even though the number of people pulling in for help had fallen to about 100 on Saturday from about 400 on Friday, local officials were alarmed to learn of plans to shut the center down. Morgan Bush, 24, said she was still struggling to feed her five children, even though her house, in a rural area just south of town, was only lightly damaged. 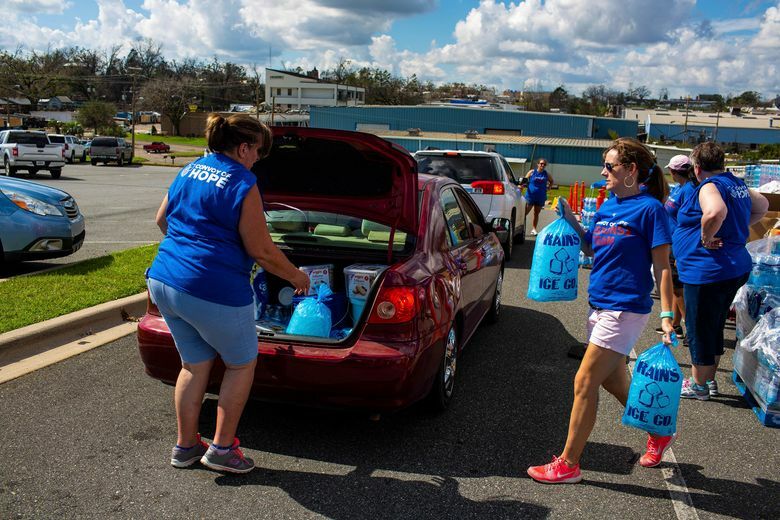 On Saturday, she pulled up to an impromptu aid station set up by three friends from the Tampa area who had driven north with supplies culled from their cupboards and local churches. “We really need help — not having power for this long makes it really hard,” Bush said, as she loaded provisions from the small stock of cans and toilet paper arrayed on a tarp in front of a wrecked downtown hardware store. “We came here because we know people are going to start forgetting,” said one of the volunteers, Norma Ward, 49, a home health care provider from Plant City. She said she chose to go to Marianna in part because she believed Panama City was getting most of the attention at the expense of other areas. At the moment, there is no shortage of relief in Jackson County. The work of restoring the power goes on around the clock, with more than 1,000 utility workers on the job. Faith groups like the Convoy of Hope, the humanitarian arm of the Assemblies of God Church, and the Southern Baptist Convention say they have no intention of scaling back their efforts until the need abates. Aid had been slow to reach some rural parts of the county, but by the weekend, most residents with storm damage had heard from Federal Emergency Management Agency officials about repairs and temporary housing. Still, many people displaced by the storm struggled to find help as they dealt with spotty cellphone service and the shock of a life-changing event. Joseph R. Hill, his wife and three young children have been living out of his silver SUV for the past week. After racing north to avoid the worst of the storm’s winds, he returned last week to find that the spacious three-bedroom house he bought 14 months ago had been heavily damaged, and flooded with rainwater. He registered on the FEMA app, and an inspector came out to Marianna on Friday. But on Saturday, Hill was still unsure of the status of his application for temporary housing, and had sent the rest of his family to live with a relative in Port Charlotte. “I just sense there’s a lack of care,” said Hill, an unemployed former corrections officer. Two friends were helping make repairs to the peeled-back roof of his house as new rain began to fall. There are signs that the region is slowly recovering. Power has returned to downtown Marianna, allowing a few stores to reopen, including a gas station and a Winn-Dixie supermarket. “It does a lot of good for people to look out and see the glow of those lights at night,” said Louis Roberts III, the county sheriff. On Saturday, Gov. Rick Scott toured one of the PODs at a church in Marianna, and repeated his pledge to provide local leaders with anything they needed. He said he was pleased with the relief effort overall, but he lamented that the loss of communications during the height of the storm hampered initial recovery work. The recovery is also progressing at a crawl in the hardest-hit places nearer the coast. In Bay County, which includes Panama City and Mexico Beach, vehicle traffic regularly comes to a standstill, utility trucks block roads, and spray-painted pieces of plywood stand in for missing street signs. But the crowds have dwindled somewhat at places in the county offering free food and water, and lines for gasoline are easing every day. Cellular phone service — still at just 66 percent of normal on Sunday — has been improving. A high school football game was played on Saturday, and public schools were expected to reopen no later than the week of Nov. 12. On Friday night in Panama City Beach, a band played at a cafe known as Dat Cajun Place while servers brought out heaping platters of shrimp Creole and bread pudding. There were a few reminders, though, that life had not fully returned to normal: Utility workers filled a few tables, bottled water was served because of contamination fears, and last call was at 8:30 p.m. on account of the local curfew. Andreasen thinks he can relax Jackson County’s 7:30 p.m. curfew next week. 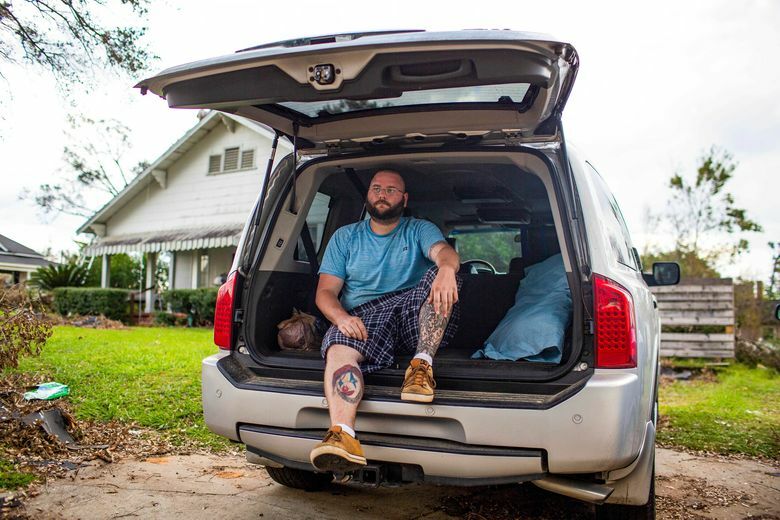 But even as he tries to kick-start normalcy in the county, he is beginning to grapple with the years of recovery that loom ahead, and the toll it has taken on his own family, which has relocated over the state line to Enterprise, Alabama. “I was talking to this girl the other day who told me how she had lost everything,” he said — his voice suddenly choking with emotion.